I began blogging Friendship Tea one year ago today. I had no experience blogging (or writing) and had no idea what I would post, but I was inspired to blog after a few months of reading several beautiful and informational blogs. I previously attempted to journal and quickly found the written journal was not for me! Blogging however, has become a fun hobby, a therapy of sorts, and a wonderful way to meet different people from around the world! If you are a regular visitor, you know Friendship Tea is about the adventures of my family, enjoying time with friends, life in Kentucky, and my passion for TEA the BEVERAGE, TEA the CEREMONY and collecting all things TEA! 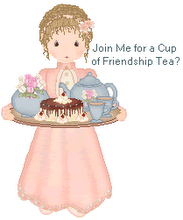 In celebration of my one year anniversary of blogging, I am announcing a giveaway of a Friendship Tea Package. This giveaway includes: the book Friendship Teas to Go by Emilie Barnes with artwork by Susan Rios, a blue floral teacup and saucer and an assortment of Harney & Sons (loose leaf) tea sachets. Leave a comment on this post between now and Monday evening, January 19th at 6:00 p.m. A winner will be randomly drawn at that time and announced on Tuesday morning. I know there are a bunch of you out there who read this blog but hesitate to comment, so this is your opportunity to post a comment to enter the drawing for this fabulous and fun tea gift! I look forward to your comments! I know how you feel about blogging. It has been the same for me. Wonderful new friends. How lovely that you're keeping traditional English afternoon tea traditions so far away from us here in the uk. I'll raise a cup to you next time I'm having a cuppa. I love to visit tea rooms here in Britain. Happy blog anniversary Linda! I have enjoyed reading all your posts. I hope you do another Kentucky Durby series this year. It's been fun getting to know you. I hope you have many more wonderful years of blogging. Congratulation on one year! It is fun. I am a lurker but wanted to say thanks for sharing. I enjoy reading your posts. Happy anniversary, Linda! I found your blog a few months ago, and went back 'in time' to read what I had missed, as I love your style of writing! Enter me in your giveaway, please!! Congratulations on your anniversary. I love your blog even though I don't drink tea so I won't enter your competition. I'll leave that for the tea lovers. I wish you many happy years of blogging. Congrats on your one year blogging anniversary Linda! I just found your blog and I look forward to following it and catching up on your posts and learning more about tea from you. I just started a blog this summer and have met the most wonderful blogger friends already. This is an amazing community. I am a tea lover and collect tea cups so please add my name to your giveaway drawing. I share your passion for blogging. It has indeed opened a while new world. What a lovely idea to celebrate your blogging anniversary... The cup and saucer are so pretty. Someone will be happy to win your giveaway. Hope it's me. Hi there Linda....Ihave joined you at blogspot. I have always enjoyed your blog so count me in for the drawing! I wish you a healthy and tea filled New Year! Happy Anniversary! I would love to win your lovely drawing, please put me in! Have a great holiday weekend! What a beautiful blog. I found it through another blog. I've enjoyed your blog journey very much, Linda. Thank you for such positive and uplifting thoughts each day. I'm happy to have found your lovely blog. Happy one year anniversary. Linda, I recently discovered Harney & Sons tea. It has become one of my favorites. Your Friendship Tea recipe on your side bar is a recipe I have been looking for. A neighbor of mine when I was in my 20's made that tea and I liked it so much. Guess what I will be making this weekend? Happy Blogging anniversary. I for one really enjoy your blog. You have a very enjoyable blog ... Happy Anniversary (and many more). Good Afternoon from Atlanta, GA. Yes, I'm a lurker! I've been reading your blog for some time now. What is it about giveaways that make us stop and take the time comment? I used to own and operate "Miss Lila's Tea Room" here in Atlanta. I had to close two years ago as I found out I had breast cancer. It was the saddest day of my life closing the Tea Room. I enjoy reading all the blogs out there about tea. I love taking tea. Please consider me for your giveaway. I've always wanted that book. Thank You. Linda, I've been a "lurker" but I'm commenting now! I love all things tea and have been a tea drinker all my life. What lovely items in your giveaway! Please enter me in your drawing. I love forward to reading your wonderful blog every day. Please continue to share yur tea loves! glad to know Linda, The Tea Lady. My goodness, how quickly this year has gone by! I love being able to travel with you by way of your blog, and I look forward to more travel adventures! Happy one-year bloggy anniversary, Linda. I have enjoyed your tea themes immensely! It's always wonderful to find kindred-spirits in blogland. Keep up the good work! I look forward to future posts. Wow I just found your blog! I like tea count me in!